Could you provide an overview of the role and mandates of supreme audit institutions in combatting corruption? Are there general differences between countries historically influenced by Francophone systems and those influenced by Anglophones? Is there best practice for pro-actively involving audit institutions including supreme audit institutions (SAI) in the fight against corruption? Audit institutions are often overlooked when stakeholders consider preventing and addressing corruption. This Helpdesk Answer builds on a previous Helpdesk Answer published in 2008 on the role of supreme audit institutions in combatting corruption. While the mandate of supreme audit institutions (SAIs) is not tackling corruption per se, their remit to oversee government revenue and expenditure gives them an important role to play in deterring and detecting public sector corruption. In fact, the nature of SAIs’ work from verifying public accounts, assessing regulatory compliance and ensuring the highest standards of financial integrity means they are well positioned to contribute to anti-corruption efforts alongside other bodies, such as law enforcement or anti-corruption agencies. While the evidence base is relatively thin, recent studies illustrate that where auditing is conducted professionally and independently of outside influences, the level of corruption can be reduced as public officials are less able to hide malfeasance behind financial misrepresentation. There is a growing awareness of the potential of involving SAIs in the fight against corruption. Successful approaches include focusing audit planning on areas at high risk of corruption, cooperation and coordination with other anti-corruption bodies, and engaging civil society in audit processes. Training and capacity building activities are also important means of developing the anti-corruption expertise of public auditors as well as promoting knowledge sharing and cooperation between SAIs. Most countries have an established national auditing institution to monitor the financial operations and performance of public sector bodies. These agencies are referred to as supreme audit institutions (SAIs). SAIs are key components of the formal system of financial accountability in many countries. As the institution in charge of auditing government revenues and expenditures, SAIs act as a watchdog over the country’s financial integrity with the mandate to assess whether public funds are managed in an effective and efficient manner in compliance with existing laws (OECD 2011). They are also tasked with ensuring that the government’s reported financial data is credible and of good quality (World Bank 2001). SAIs themselves are not considered anti‑corruption bodies as they are not explicitly charged with detecting or investigating corruption. SAIs typically derive their mandates from the national constitution as well as acts or laws establishing the SAI and regulating its functions. These legal instruments generally contain a number of provisions specifying the audit functions of the SAI, including the performance of certain audit tasks. As a result of different legal and institutional frameworks, the mandate and exact nature of audit assignments of SAIs vary greatly by country. There is also great diversity in terms of their structure, professionalism, size, resources independence and transparency (Gustavson 2015). Nonetheless, a study by INTOSAI (2010a) concludes that, behind the apparent diversity of remit, they share a common core function, namely to “provide audit or assurance services by comparing economic information with a framework for financial reporting, and to produce knowledge derived from the conduct of audit investigations, which creates the basis for the implementation of corrective actions”. In other words, they all have a common commitment to ensure accountability in government finances. In recent years, SAIs have also expanded the scope of their activities, undertaking more specialised audits, such as environmental or ethical audits of public institutions (Evans 2008). All potential users of audit findings should be provided with objective, independent and reliable information based on sufficient and appropriate evidence. Audits should promote transparency and accountability in the appropriate use of public funds and assets, and the performance of public institutions. Audits should reinforce the effectiveness of these bodies within existing constitutional arrangements. Audits should create incentives for improvement by providing knowledge, analysis and well-founded recommendations. There are different models for audit institutions, the most common of which are the Westminster model, the judicial or Napoleonic model, and the board or collegiate model (DFID 2004). The Westminster model, also known as the Anglo-Saxon or parliamentary model is used in the United Kingdom and most Commonwealth countries, including many in sub-Saharan Africa. In addition, a few other European and Latin American countries have adopted the model, including Ireland, Denmark, Peru and Chile. The Westminster model is intrinsically linked to a system of parliamentary accountability. Typically, parliament authorises future expenditure by the executive branch. All public bodies are expected to produce annual accounts, which are then audited by the SAI, which produces and submits its audit findings to parliamentary body, such as a public accounts committee (PAC). In turn, the PAC issues its own reports and recommendations, to which the government responds (DFID 2004). The Westminster model is characterised by a national audit office (NAO) with a single head, often called the auditor general, who may be an officer of parliament. All rights, powers and responsibilities are typically vested in the auditor general personally, rather than in the NAO as an institution, with strong safeguards to ensure the independence of the auditor general. The role of auditor general may be combined with that of comptroller, whose function is one of control rather than audit and is performed in advance of expenditure being incurred. Under such a model, the ability of the SAI to challenge corruption depends on the powers and authority of the position and its independence from other national institutions. The auditor general needs to have high levels of personal integrity and inspire trust among all stakeholders as there is a risk of abuse of power by concentrating so much power on a single individual, particularly in states where corruption and misuse of authority are endemic. The judicial or Napoleonic model is used in the Latin countries in Europe, Turkey, Francophone countries in Africa and Asia, several Latin American countries including Brazil and Colombia. Under this model, the SAI, often a court of accounts or cour des comptes, is part of the judicial system and as such operates independently of the executive and legislative branches, having only limited interaction with parliament. The court members are judges who can impose penalties or corrections on audited officials. In some countries, the SAI may have an ex ante control function as well as an ex post audit function, meaning it also controls the disbursement of funds. The judicial model relies on Ministry of Finance officials based in line ministries and other public bodies operating as public accountants. These officials are tasked with ensuring the proper expenditure of public funds and producing their host institution’s annual financial statements. These financial statements are then audited by the SAI, which assesses the legality of the public accountant’s actions (DFID 2004). From an anti-corruption perspective, one key feature of this model is that government officials are normally held personally liable for the proper use of funds and can be held responsible for illegal payments made, which can be seen as a deterrent for corrupt practices. In addition, the vulnerability of such a system to political influence is rather low since members are judges appointed for an indefinite period. However, there can be challenges of transparency if hearings are not open and parliament is not involved, and the court may not have the ability to effectively enforce its findings and recommendations (Martini 2012). In Francophone Africa, the judicial model sometimes co-exists with general state inspectorates, which may function as the country’s nominated SAI. These state inspectorates are often part of the executive branch but independent of specific ministries and departments (OECD 2011). The OECD (2011) notes that in such scenarios, the respective mandates of the state inspectorates and courts of accounts needs to be clearly established. 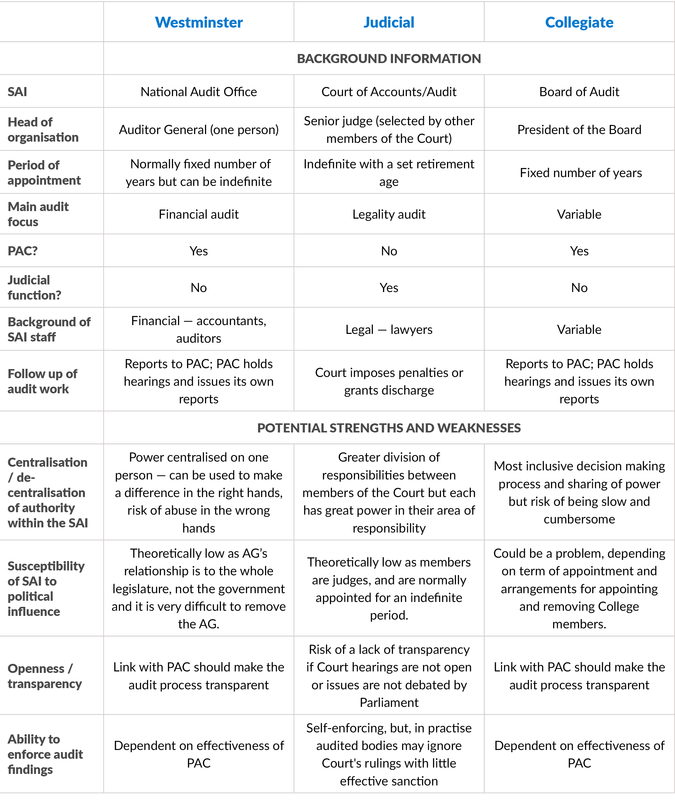 Two studies have found that countries which operate the judicial model of auditing, in which the SAI is structured as a court of audit, are associated with higher levels of corruption (Blume and Voigt 2011; Tara et al. 2016). The board or collegiate system is used by a number of other countries, including Germany, the Netherlands, Argentina, Indonesia, Japan and the Republic of Korea. Under such a model, the SAI takes the form of a college or governing board composed of a number of members who take decisions jointly. Members are normally appointed for a fixed term by a vote of parliament. Decision-making power within the SAI is shared and consensual. While inclusive, this can make the decision-making process slow and cumbersome. As members are appointed by parliament, the independence and impartiality of the college can be undermined if a political party has a dominant position and can influence the appointment process, especially if the terms of the SAIs board members coincide with the parliamentary terms. This can exacerbate further the risks of political influence (Martini 2012). As watchdogs of a country’s public financial management, audit institutions have a key role to play in efforts to curb corruption. In fact, some studies show that SAIs are generally perceived as “guardians of the public interest” and often enjoy greater levels of citizen trust than other arms of government (Tara et al. 2016). As such, some scholars argue that this legitimacy positions them to promote transparency and ethical conduct in the public sector more widely (Dye and Stapenhurst 1998). More specifically, SAIs can contribute to anti-corruption approaches in two main ways: deterrence and detection. INTOSAI’s founding principles emphasise that states must grant SAIs a mandate that allows them to contribute to the fight against fraud and corruption. As early as 1998, INTOSAI agreed that SAIs can and “should endeavour to create an environment that is unfavourable to corruption” (Dye 2008). Supreme audit intuitions contribute to the prevention of corruption by promoting sound public financial management systems based on reliable reporting and robust control mechanisms, which contribute to support transparency and accountability in the public sector (Gherai, Tara and Matica 2016; Evans 2008). The disclosure of wrongdoing through the publication of audit reports can also have a deterrent effect and discourage public officials from engaging in fraudulent or corrupt behaviour (Gherai, Tara and Matica 2016). While the primary responsibility for the detection of corruption lies with institutions such as the police or anti-corruption agencies, the public expects SAIs to play a key role in uncovering malpractice. Indeed, auditors are experts in detecting fraudulent financial reporting which can conceal corrupt activities (Dye 2008). Falsified statements and claims, illegal bidding practices, tax and customs evasion, overpayment and non-delivery of good and services as well as malpractice in the liquidation of public companies are some of the fraudulent and corrupt activities that auditors may encounter. While SAIs have limited capacity and authority to investigate cases of corruption, they can pass cases on to the relevant authorities. Some countries, such as Germany, Sweden and the UK, explicitly require SAIs to report instances of suspected corruption (Kayrak 2008). Corruption may be detected during all three types of audit: financial, compliance and performance. The primary purpose of financial audits is not to detect corruption but to ensure that financial statements are not misleading and reflect an organisation’s genuine economic transactions. Having said that, inaccurate or incomplete statements can indicate fraud, embezzlement or corruption (Otalor and Ofiafoh 2013). Corruption is more often revealed through compliance audits, which are designed to ensure the legality of financial transactions and verify that these comply with existing laws, rules and regulations. Breaches of laws and regulations may indicate fraudulent or corrupt activities. Similarly, performance audits that assess the management of public resources can be designed to include some references to laws and regulations and thereby help identify fraud and corruption (Dye 2008). Indeed, when a project or programme exceeds its planned costs, takes longer than expected or fails to achieve the planned results, this could be a red flag and merit further investigation to ensure probity (Otalor and Ofiafoh 2013). There are relatively few cross-country empirical studies on the effect that good quality auditing can have in reducing levels of public sector corruption. The literature is especially sparse on the role of auditing in detecting and deterring corruption in developing countries as well as on which type of audits are most effective in tackling corruption (Assakaf, Samsudin and Othman 2018). However, several studies contend that public audits have the potential to reduce corruption, and a recent literature review (Assakaf, Samsudin and Othman 2018) concludes that the available evidence does suggest that auditing helps curb corruption. A 2008 cross-country analysis of 133 countries found that higher quality auditing standards in the public sector had a pronounced effect on reducing corruption (Dipietro 2011). A more recent study using a sample of 78 countries confirms these findings, indicating that strong SAIs have a notable impact on reducing corruption, especially where SAIs are entrusted with greater sanctioning powers (Ortiz Ramirez and Cruz Perez 2016). This is supported by another study based on survey data from over 100 countries, which found that where audits are conducted independently and professionally, there is a significant impact in reducing public sector corruption (Gustavson and Sunstrom 2016). Using a sample of provincial data from China from 1999 to 2008, another paper shows that audit institutions are able to detect corruption and take action to rectify the problems identified (Liu and Lin 2012). Across the provinces studied, the authors found that the number of irregularities detected in government auditing was positively related to the level of corruption. In addition, in areas where corrective action was conducted more vigorously, auditing became more effective and the level of corruption was markedly reduced (Liu and Lin 2012). Similarly, studies of EU countries show that SAIs can contribute significantly to improving the efficiency of governmental activity and have a notable influence on the perceived level of corruption in a given country (Tara et al. 2016; Gherai, Tara and Matica 2016). The more extensive an SAI’s work, the more it contributes to reducing corruption (Gherai, Tara and Matica 2016). However, the effectiveness of an SAI also depends on the extent to which its recommendations are acted upon by the relevant actors, be this public accounts committees, courts or law enforcement. Unsurprisingly, this varies widely depending on context (Tara et al. 2016). More recently, an evaluation of government anti-corruption audit programmes aimed at uncovering the misuse of public resources at the local level in Brazil showed that audits can be an effective tool to reduce corruption (Avis, Ferraz and Finan 2018). The authors posit that elected public officials may refrain from corruption if they are concerned that audits will increase the probability of their corrupt behaviour being exposed to the voters and compromise their re-election. Similarly, audits may increase legal and reputational costs, even in the absence of re-election incentives (Avis, Ferraz and Finan 2018). Alongside an adequate mandate, the level of independence an SAI enjoys is a key determinant of its ability to counter corruption. For an oversight mechanism such as an SAI to function adequately, it is crucial to separate its operational control from the ministry or other public body nominally subject to its supervision (Gustavson 2015). External interference in operational decision making as well as the appointment or removal of staff will cripple an SAI’s ability to fulfil its mandate. Financial and administrative autonomy is also key to ensuring the independence and impartiality of SAIs. In addition, sufficient human, financial and material resources need to be allocated to ensure that audit institutions can carry out their activities in a professional, independent and impartial manner (Martini 2012). Audit reports should be made publicly available to increase transparency and accountability of public institutions. However, in the absence of a mechanism to ensure auditors’ recommendations are followed up on, public SAI reporting alone has been found to be insufficient (Gherai, Tara and Matica 2016). 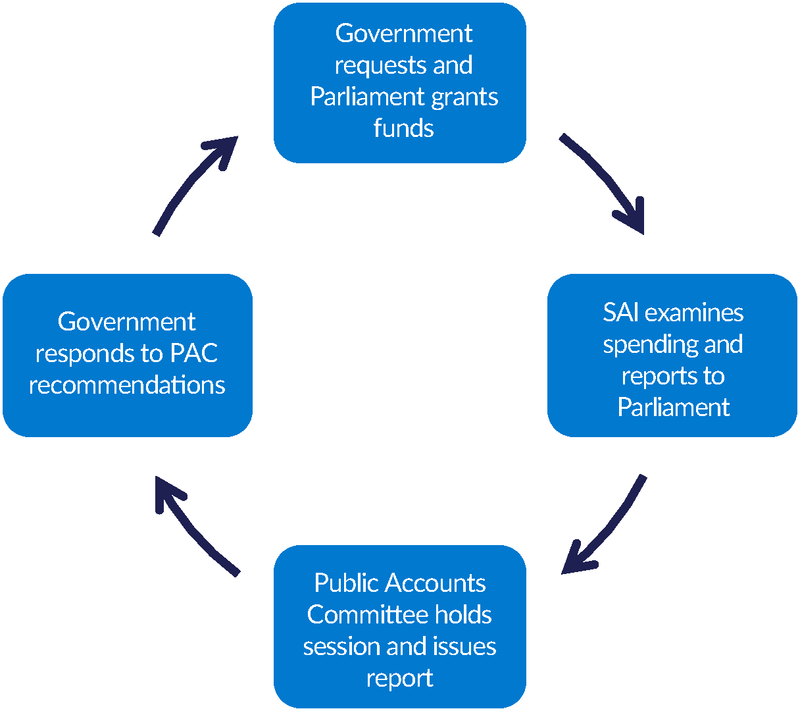 Where SAIs are required to report their findings to parliament on a periodic basis, this can help improve effectiveness as public accounts committees can pressure audited bodies to comply with SAI recommendations. In countries that employ the judicial audit model, interactions with parliamentarians may be less common than under the Westminster model. However, there should still be opportunities to report audit findings to parliament. For instance, in judicial model countries, it is typical for the Ministry of Finance to present a report on the state account to parliament (DFID 2004). In Norway, for example, SAIs must report their findings to parliament rather than the executive or the administration (Transparency International Norway 2012). Another important determinant of the effectiveness of audit institutions is the professionalism of the officials conducting the oversight activities as a lack of expertise creates greater dependency on the body being audited and reduces opportunities to be critical with regard to the information obtained through the audit process (Gustavson 2015). Limited research has been conducted on how SAIs have taken an active role in detecting and investigating corruption across the various auditing models outlined above. However, a few principles emerge from the literature on how to involve audit institutions to help counter corruption. These include risk-based auditing, coordination with other anti-corruption institutions and law enforcement, and engagement with the public, among others. SAIs can play an important role in the detection of corruption by identifying and monitoring corruption “hotspots”. By focusing audit efforts on areas known to be susceptible to corrupt practices, such as public procurement, SAIs can assist other anti-corruption players by producing hard financial data. Such risk-based approaches to auditing can be built into the planning process, during which the focus of the audit is identified (Evans 2008). Some SAIs have taken specific measures to embed anti-corruption approaches into their work from the planning process onwards. The Hungarian State Audit Office (SAO), for example, contributes to the fight against corruption in three major ways. First, during its audits, SAO pays special attention to the identification of corruption risks and takes them into consideration at the audit planning stage. The SAO also compiles summary reports examining corruption trends, assessing corruption risks and analysing the reasons for corruption. Finally, the SAO initiates the sanctioning of corruption when evidence is well-established by referring its findings to relevant authorities such as the police or prosecutor’s office. As of 2008, the SAO had initiated criminal procedures in 74 cases and a total of 131 suspicions of criminal acts had been reported (Netherlands Court of Audit and the State Audit Office of Hungary 2008). For its part, the Austrian Court of Audit has prepared Guidelines on Auditing Corruption Prevention Systems to systematically integrate anti-corruption work into the auditing process, providing guidance to the audit teams throughout the auditing process (EUROSAI 2016). It is essential to have effective mechanisms in place to ensure the implementation of SAI recommendations. The nature of these mechanisms depends on the country’s audit models. SAIs using a Westminster auditing model typically report their findings to a parliamentary public accounts committee (PAC). PACs can make the report findings public, demand reforms and follow-up on whether audit findings and recommendations have been addressed. SAIs operating under the judicial model rely on the judiciary to ensure that recommendations are implemented and concerns are addressed (Evans 2008). As SAIs are not anti-corruption agencies, it is essential that they collaborate and coordinate their work with other anti-corruption and law enforcement institutions. SAIs should be empowered to refer suspicions of fraudulent and criminal activities uncovered during the audits to the competent authorities, such as in Hungary. However, cross-agency coordination of anti‑corruption activities remains weak in many countries. To address the issue, some countries have established specific coordination bodies and law enforcement agencies. In Bulgaria, for example, the Interministerial Commission for Coordinating Actions against Corruption was established in 2002, while in Bolivia, this anti-corruption coordination mandate was given to the SAI itself (Chene 2009; Martini 2012). SAIs rarely rely on the work of internal auditors (Dye 2008). However, there are many potential benefits of ensuring collaboration and cooperation between SAIs and internal auditors. Such benefits could include knowledge sharing, more focused and efficient audits, reduced risk of duplication through coordinated planning and communication, maximum audit coverage based on risk assessments and mutual support on audit recommendations (INTOSAI 2010b). collaborating on certain audit procedures, such as collecting audit evidence or testing data. Coordination between SAIs and other agencies is, however, not always straightforward. The difference in mandates, but also the rivalry between different agencies can have significant impact in the fight against corruption. In Nigeria, for example, the lack of cooperation between different anti-corruption bodies is seen as one of the main problems in President Muhammadu Buhari’s anti-graft campaign (Ibukun and Mbachu 2017). When agents of Nigeria’s financial crimes body attempted the arrest of a former intelligence chief fired by President Muhammadu Buhari for stashing $43 million in cash in his wife’s apartment, they were stopped by armed secret policemen. Inter-agency rivalry has been a consistent feature of Buhari’s anti-corruption efforts. He has sent the nomination of Magu as head of the financial crimes commission, known as the EFCC, to lawmakers for approval, and on both occasions they rejected him based on state security police reports of alleged prior wrongdoing, which has weakened the agency (Ibukun and Mbachu 2017). The professionalism of audit institutions is a key factor of their success and effectiveness in fulfilling their mandate and countering corruption. This means that the qualification and technical expertise of staff needs to be of high quality. In Slovenia, for example, 67% of SAI employees have higher education qualifications and 25% have a master’s degree or a doctorate. In addition, professionalism within the court of auditors is ensured through the provision of mandatory training for all staff (Transparency International Slovenia 2012). In addition, training and capacity building activities to develop the anti-corruption expertise of SAI officials are an important means of strengthening their role in the fight against corruption. Anti-corruption auditing is a relatively recent and specialised field, and little has been done so far to build auditors’ expertise in this area of work (Otalor and Eiya 2013). The international community or INTOSAI and its regional affiliated bodies could lead in organising training seminars and conferences on anti-corruption auditing and support the development of training materials and programmes (Otalor and Eiya 2013). At the national level, a core group of anti‑corruption experts can be established within the SAI to review government-wide laws, regulations and procedures to identify corruption risks. Otalor and Eiya (2013) contend that SAIs should aim to develop standard audit criteria able to deter and detect corruption across different agencies and departments. Such an expert group could also be responsible for training other auditors in corruption auditing (Otalor and Eiya 2013). Transparency in budget and audit processes is essential to enable citizens to hold public officials accountable for the way they use public resources (Ramkumar 2007). In 23 countries, findings from audit reports are either not released within 24 months of the end of the budget year or are never released to the public, and in 10 of these countries even the legislature does not receive audit reports. In 25 countries, the audit reports do not contain an executive summary and therefore may not be easily understood by the public. In 30 countries, the executive, legislature or SAI does not report publicly on steps taken by the executive to implement audit recommendations. In other countries, however, SAIs have led by example in promoting transparency by committing to the open data and open government agenda. For instance, in 2015 the French court of accounts signed up to the national action plan for the Open Government Partnership and committed to making public financial data available to the public via an online platform (EUROSAI 2016). Experience shows that civil society can play a constructive role in supporting public auditors in exercise oversight of government agencies. Civil society can engage with audit processes in a number of ways, from conducting independent audits or participating in public audits to using SAI findings to hold government agencies to account. In India, for example, the Mazdoor Kisan Shakti Sangathan (MKSS) – a peasant and workers’ union – conducts social audits of local government expenditures in village communities, using public hearing forums to identify instances of fraud and corruption. In South Africa, the Public Service Accountability Monitor (PSAM) – a research and advocacy organisation – works closely with the legislature to track government agencies’ responses to instances of financial misconduct and corruption identified in the auditor general’s reports (Ramkumar 2007). Some SAIs are becoming increasingly open to citizen participation in audit processes. In South Korea, for example, the Board of Audit and Inspection (BAI) has introduced a number of schemes to encourage citizen participation in public audits. This includes a citizens’ audit request system that allows citizens to request special audits of public institutions suspected of corruption. In the Philippines, the national Commission on Audit (COA) has established partnerships with several civil society organisations to conduct participatory audit exercises, mainly focused on performance audits (Ramkumar 2007). A few years ago, INTOSAI conducted a survey of its 190 members to identify innovative practices of SAI public engagement strategies (United Nations 2013). Findings indicate that while almost all SAIs use their website to communicate their audit results to the public and raise awareness about their activities, very few SAIs actually involve citizens in decision-making processes. The Netherlands Court of Audits uses social networks such as Twitter and LinkedIn and crowdsourcing to gather knowledge from citizens, announce new audit reports and make the public aware of parliamentary reactions to audit findings. In Indonesia, the law related to the audit of management and accountability of state finance requires the SAI to consider citizens’ input in the performance of its duties. As a result, the SAI developed and implemented public relations and communication strategies. In Honduras, the SAI organises workshops with social organisations and citizens to detect irregularities in public officials’ use and management of public resources and assets. The Department of Control and Follow up of Citizens Complaints is charged with the investigation of allegations and follow-up in collaboration with the auditors. Knowledge sharing and cooperation between SAIs is also important to improve their ability to meet the Lima objectives. SAIs can sign memorandums of understanding to cooperate with each other, share knowledge and expertise, and run joint training sessions on corruption-related auditing (Otalor and Eiya 2013). Some mechanisms are already in place, such as staff secondment and twinning initiatives, mainly focused on sharing technical expertise on a range of audit activities. However, very few initiatives specifically focus on corruption-related auditing. Evans (2008) proposes that INTOSAI’s Capacity Building Committee and its regional affiliated associations could provide a forum for building the technical capacity of SAIs to address corruption. INTOSAI is the international umbrella organisation association for 190 supreme audit institutions.